This was a paid commission for a future auction that the well-known entrepreneur and philanthropist Mark Brand will hold later this year to raise funds for his charities in Vancouver. 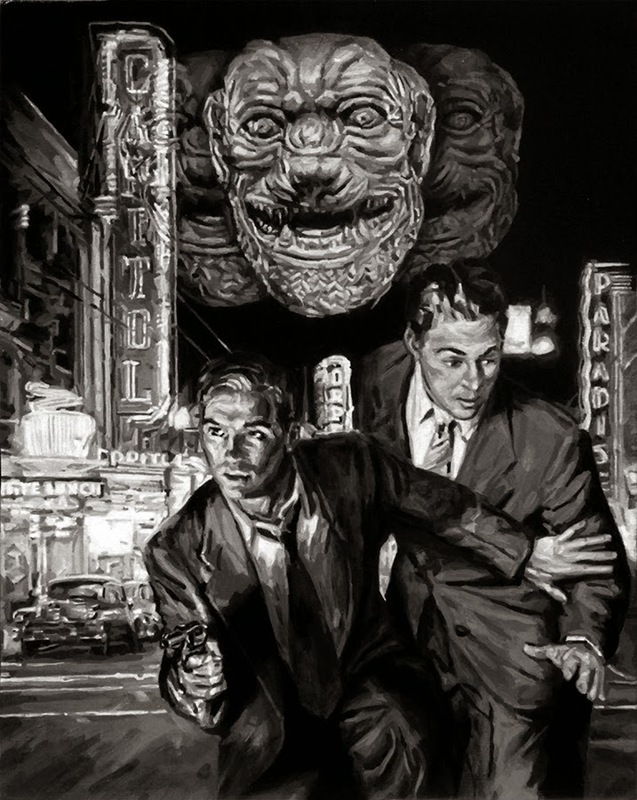 The theme, initiated by the local Vancouver artist Andrew Young, was "Pulp" (in any way that I saw fit)... so I painted a "mash-up" of 1940's gangsters and a Babylonian demon, Pazuzu the demon from 'The Exorcist', all set in the neon-lit night-scape of Vancouver's Granville Street. As one does. It is a tiny black and white illustrative painting, both things that I don't normally do. I however enjoyed painting this piece even though it is far outside what I normally do.